Thoroughbred Charities of America (TCA) is pleased to announce the winner of the Sixth Annual TCA Youth Essay Contest. Kaelyn Penick, 18, of Appomattox, Va., has been named the winner of the contest. The contest was open to recipients of services, volunteers, supporters or anyone, 18 years of age or younger, that has been impacted by an organization that received a grant from TCA in 2018. To participate, contestants submitted an essay containing a minimum of 300 words and a maximum of 600 words, describing how a TCA grant recipient has affected his or her life. Essays were judged by select TCA board members and staff of BloodHorse Publications on numerous criteria including the presence of a compelling and passionate argument, grammar, vocabulary and style, neatness and adherence to contest rules. Penick wrote about her experience at War Horses at Rose Bower, a Thoroughbred aftercare organization that provides rehabilitation, retraining, rehoming, and retirement services to Thoroughbreds. The organization will receive a grant of $1,000 for Penick's essay. Read her essay here. TCA's mission is to provide a better life for Thoroughbreds, both during and after their racing careers, by supporting qualified repurposing and retirement organizations and by helping the people who care for them. TCA distributes grants to several categories of Thoroughbred-related nonprofits including rehabilitation, retraining, rehoming and retirement organizations; backstretch and farm employee programs; equine-assisted therapy programs; and research organizations. Since its inception in 1990, TCA has granted over $23 million to more than 200 charities. TCA also administers the Horses First Fund, a fund started by LNJ Foxwoods in 2016 to provide emergency aid for Thoroughbreds in need. TCA is the charitable arm of the Thoroughbred Owners and Breeders Association (TOBA). Read more at Thoroughbred Charities of America. 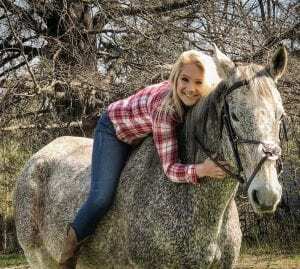 This entry was posted in Horse Care and tagged aftercare, blood-horse, contest, essay, Kaelyn Penick, tca, thoroughbred charities of america, War Horses at Rose Bower, winner by Press Release. Bookmark the permalink.